My wife and I wanted to dress up as a couple for Halloween, but we didn’t want to do your typical couples costume. Everyone has seen the typical Aladdin and Jasmine, but have you ever seen Aladdin and Carpet? We made a trip to the local fabric store and found the right colors for Aladdin’s costume. We decided to go with the “Street Rat” look. Found the right colors and found a pattern for the vest and the “MC Hammer” pants. The tough part was finding a costume for Carpet. We found a blanket that had a classic pattern. We decided to use 2 blankets and sew them together. We left an area to put your legs through and then left the top open with string to close the top once inside. For the tassels we used yarn. I wore gold cloves and socks to camouflage my feet with the tassels. 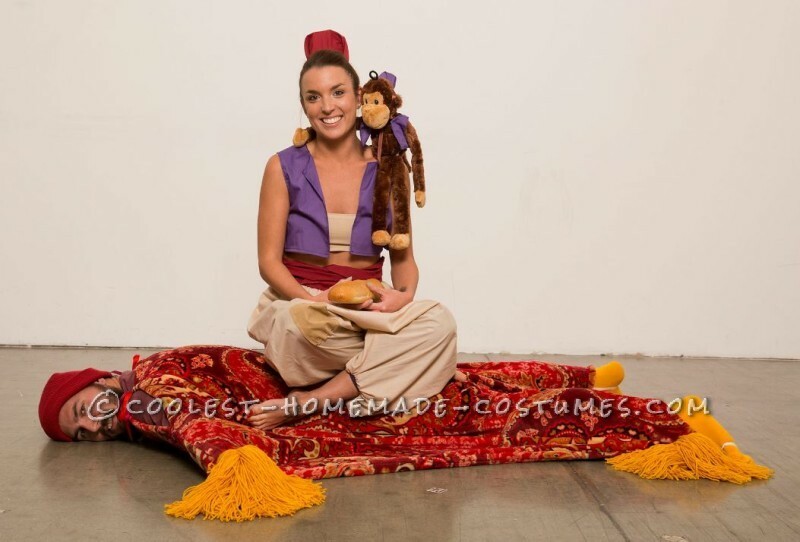 The last little touches that brought the costume together was a monkey stuffed animal with a vest and hat to be Abu, a loaf of bread, a phone/stereo with the Aladdin soundtrack playing and a disguised skateboard for carpet to ride around on. For the skateboard, we put 3 crates stacked with a piece of flat wood on top of the skateboard. We then covered everything with blue fabric so it would give the look of us being in the sky. I layed down on my skateboard contraption and then Aladdin sat on top of me. Then we rolled around and the costume is complete. We entered a contest at work but there was an issue. There were 2 contests, an individual contest and a group/department contest. We did not qualify for the individual contest because there were 2 of us and we didn’t qualify for the group/department contest because we weren’t big enough to be considered a group. Everyone at work said that we should have won and that we were robbed.